This TRILLION THEORY site estimates our cosmos at a trillion years. WHAT IF my TRILLION THEORY is right as a new cosmic paradigm? Welcome to TRILLION THEORY (TT) founded by 'Trillionist' Ed Lukowich. T Theory drastically alters how we understand our universe. BLACK HOLES, over a trillion cosmic years, built and recycled suns and solar systems inside ancient 800-billion-year-old galaxies. Who or what designed black holes to be cosmic builders? Hi from trillionist Ed Lukowich (world's newest theorist) with his 5 book Trillion Theory series. Ed says, "It is by traveling back a trillion years to the cosmic origin that we discover how the artificial intelligence of black holes built all the gigantic galaxies. Mechanisms hidden deep inside BLACK HOLES hold the greatest cosmic secrets." Trillion Theory published its 5 books series from 2013-2018 at Amazon. 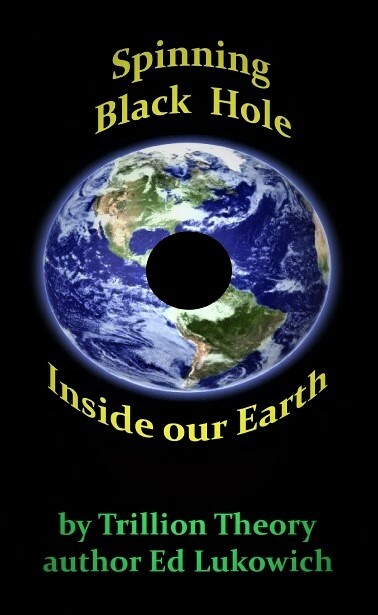 🔺 The 1st to declare that a smallish black hole resides inside our planet. Operating at middle Earth, this black hole provides our Earth's axial spin and gravity. 🔺 1st to declare that our Sun has a black hole inside. Size matters: the black hole inside our Sun is the largest in our solar system, exhibiting gravitational control over all of the lesser sized black holes that reside inside each of the planets and moons. 🔺 1st Trillionist to estimate cosmos as a trillion years old; far more ancient than the 13.7 billion years estimated by an incorrect Big Bang. 🔺 1st, via T Theory, showing how cosmos grew over a trillion years to a gargantuan 73 quintillion stars in billions of solar systems and galaxies. 🔺 1st, via T Theory, to possibly open up a whole new space-age with speedier near-instantaneous travel across light years of space. Trillion Theory published in 2015; 1st book in T Theory series. Non-fiction, in paperback and ebook. See TT's hidden mechanisms which grew our universe prodigiously over its ultra-long trillion year history. Remarkably, TT alters the cosmic origin, while refuting a Big Bang which proposes an explosive beginning just 13.7 billion years ago. Instead, TT shows an initial small universe which systematically grew into trillions of spheres within billions of solar systems and galaxies. Trillion Years Universe Theory published 2015; 2nd book in the T Theory series. In paperback and ebook. This book takes Trillion Theory and adds in an Interviewer, who on behalf of the reader, asks Ed pertinent questions regarding his new theory. Ed describes how his T Theory shows a viable alternative for a cosmic origin, while refuting Big Bang's estimate of only a 13.7 billion year cosmic origin. Spinning Black Hole Inside Our Earth published 2017; 5th book in T Theory series. In paperback, ebook. This shortest series book (only 45 pages) is a brief summary of T Theory, focusing on the black hole inside of Earth. Shown is how black holes form spheres around themselves and thereafter function in control of their sphere and any other smaller spheres in their orbits. 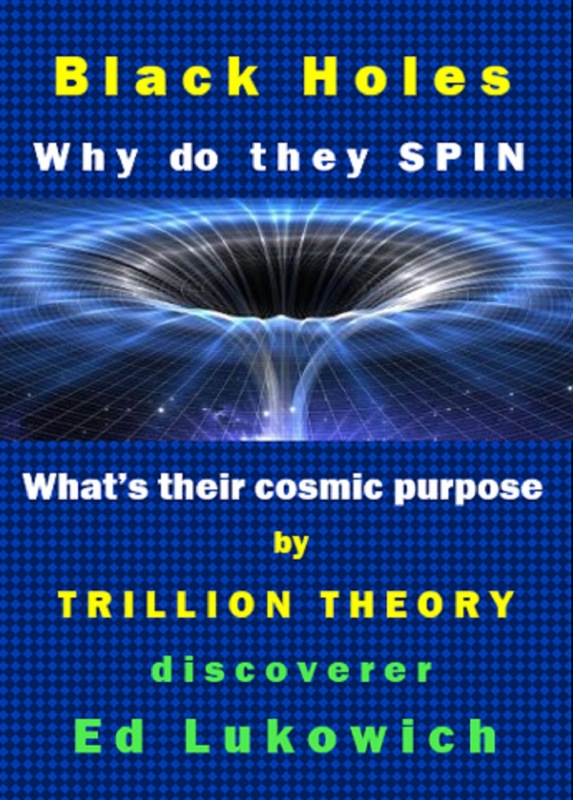 Newest in the TRILLION THEORY series: 'Black Holes: Why Do They SPIN' (2018)(available as eBook at Amazon), 'Supermassive Ancient Galaxies' (2018)(short TT summary treatise)(see FREE at top heading of this page). The Trillionist by Sagan Jeffries (pen name of Ed Lukowich)(published Sept 2013 by Edge Publishing). In this new futuristic sci-fi novel, 'Trillionist' is a new word, not yet found in a dictionary, defined as a being or entity who is a trillion years old. It is a derivative of 'trillion' plus the suffix 'ist'. Created by author Sagan Jeffries, The Trillionist promises to change your cosmic views. Right above, click on an individual symbol to discover its meaning. Also within the novel, use your cell phone over a QR code to visit Exhibits. The Storyline: A miraculous young man on Planet Tidon is possessed with incredible abilities right from his first day of birth. If only he knew where they came from? It is up to him to overcome his villainous nature and save his world from catastrophe. In the process, he uncovers secrets depicting how our universe grew to a ginormous 73 quadrillion stars within billions of galaxies and solar systems. Testimonial: "The Trillionist is an auspicious debut from a powerful new voice. Sage Rojan is a character you'll never forget." -- Robert J. Sawyer, Hugo Award-winning author of Red Planet Blues. Edge Science Fiction and Fantasy Publishing is the publisher of The Trillionist. Ed is on Facebook LinkedIn Twitter. See Ed's books at Amazon, Goodreads, Chapters, Barnes Noble, Books A Million and Smashword.